In Weipa, QLD Australia, McConnell Dowell is building a new bauxite terminal for Rio Tinto. 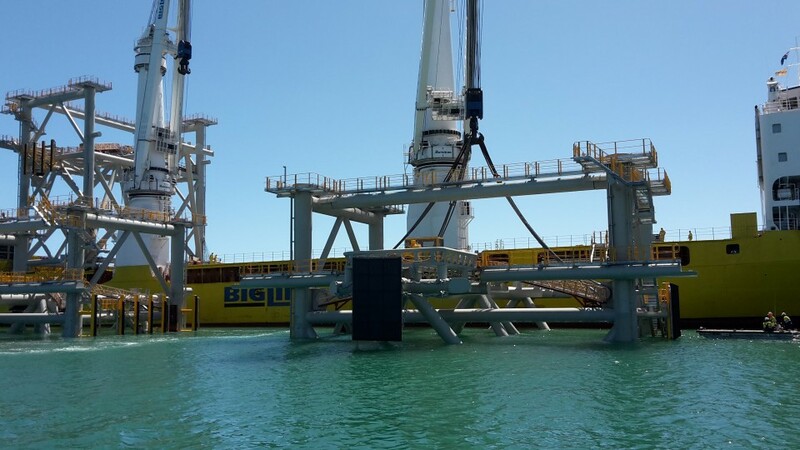 For this terminal a complete quay was designed, whereby BigLift’s engineers were asked to give their input for the feasibility study and the design of the new quay parts. They had to consider factors such as lifting, seafastening, transport and the available loading space. 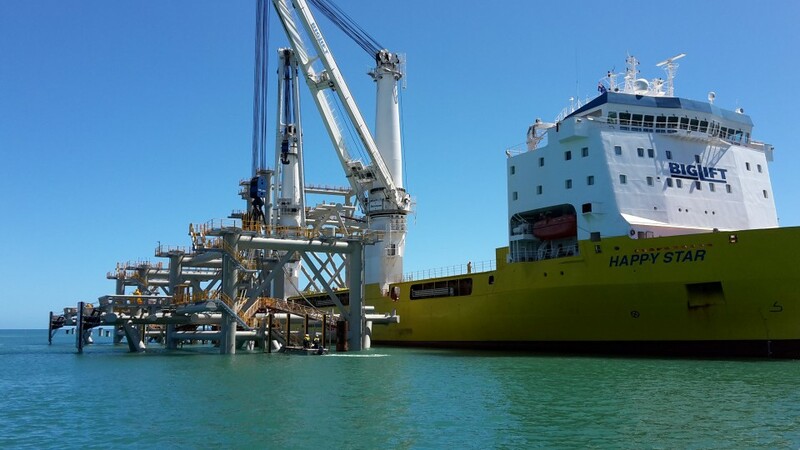 The quay is built from scratch: jackets must be positioned on the sea bed in Weipa, then wharfdecks are placed on top and the quay is built up from additional materials being brought in by Happy Star. This is a new concept which means that fewer piles are needed compared to previous quay constructions. All the parts for this special quay had been built in Nantong, China. 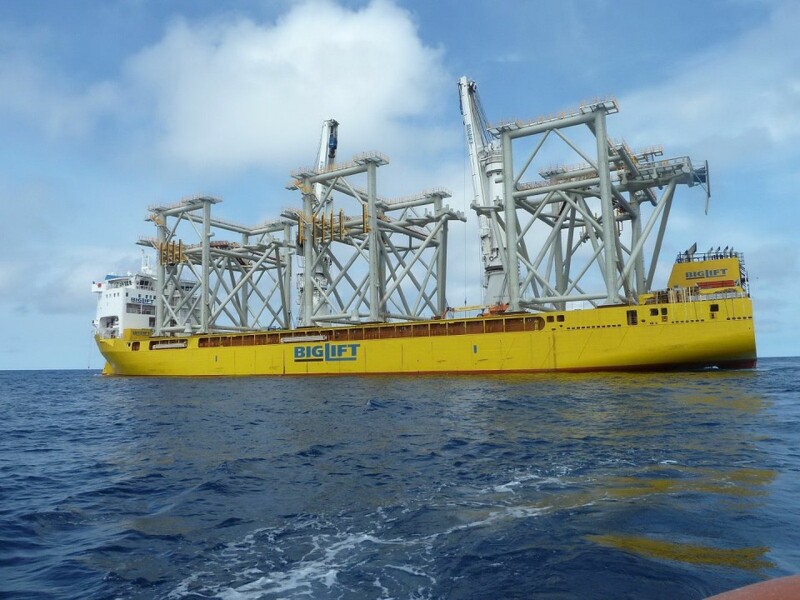 Happy Star collected the first cargo of 31 piles and three jackets together with various smaller items. 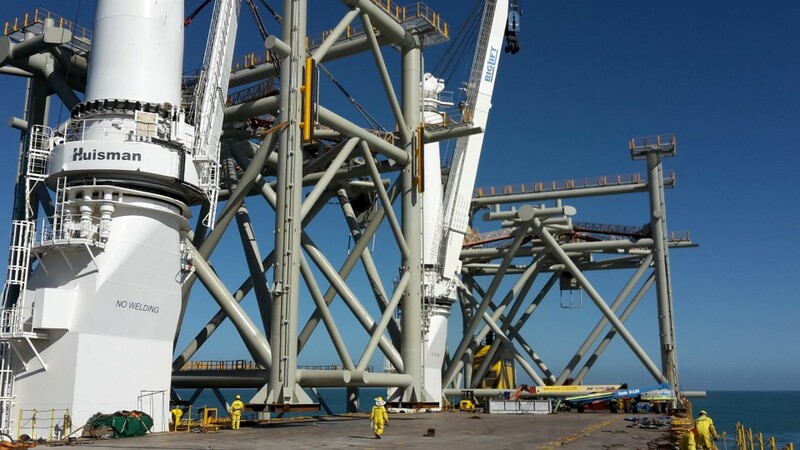 These jackets were very large – 38.4*35.8*30.6 m and represented 680 mt – and because of their size, one side of the jacket was left partly open in order to let the crane jib in for the lifting operation. Additionally, special grommet bridges were designed which ended in a central floor inside the jacket so that the grommets could remain in place during the voyage. The jackets were so high that it was not feasible to take the lifting equipment away after the jackets had been loaded. Since the quay was effectively on Happy Star when she arrived for her first discharge, a pre-installed mooring spread was created. 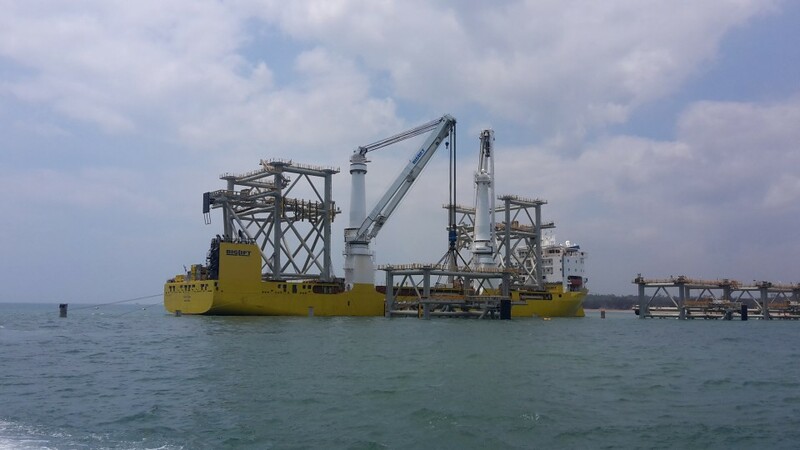 The first three jackets were positioned with the aid of the guiding piles and while Happy Star sailed back to China for a new load, the newly positioned jackets were made ready to receive the wharfdecks coming in with the next voyage. These wharfdecks were designed to fit exactly in Happy Star’s hold. This second voyage saw Happy Star being loaded to the brim, with three more jackets, three of the six wharfdecks and a great quantity of smaller items, totalling some 140,000 freight tonnes in all. 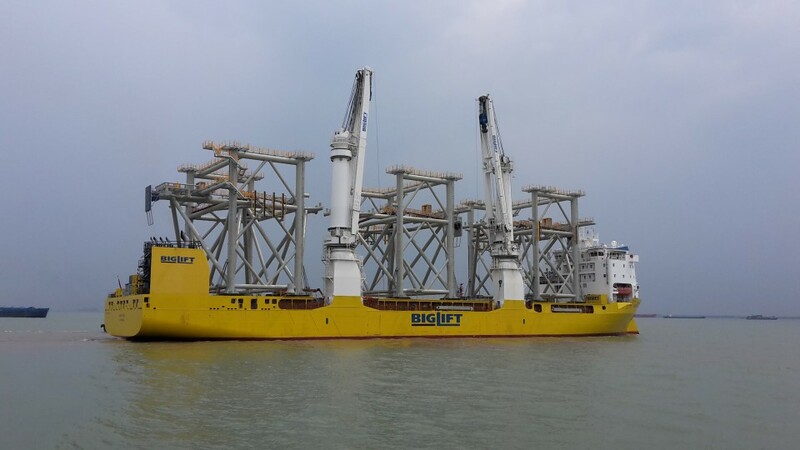 For voyage three, Happy Star will load the last jacket and the three last wharfdecks – the largest 1035 mt and measuring 56.9*25.5*6m – and the rest of the smaller items. 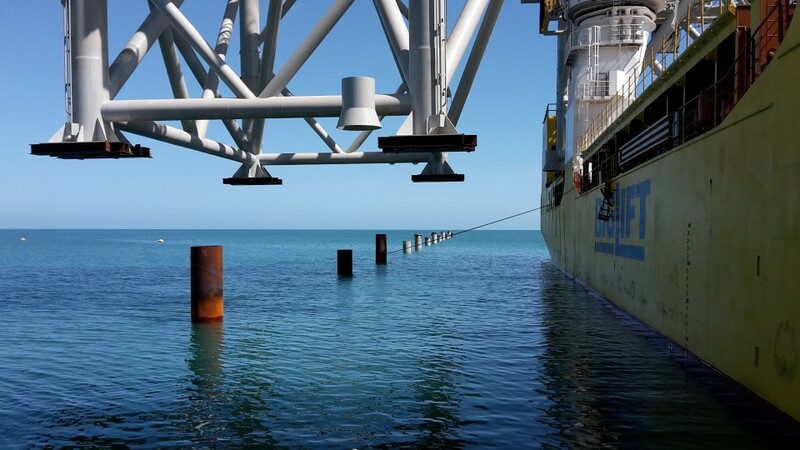 When Happy Star first arrived at Weipa, she encountered a row of guiding piles in the seabed. When she leaves after unloading the third load, some three months later, a completely new quay will have arisen.